There has been some talk of the introduction of a living wage in Bermuda. That would be a mistake. A living wage, or minimum wage puts a heavier burden on businesses that already struggle to employ people at the bottom rungs of society. It adds more complexity, bureaucracy and oversight in order to ensure it works. It has a risk of eliminating jobs and increasing costs rather than creating jobs. A better proposal would be to introduce a universal basic income. Let’s use a simple example considering the recently announced 1% tax hike. Assume you have 10 people, one who makes no money and then each subsequent person earning $20,000 a year more than the previous person. In total, they would earn 900,000 a year in income. A 1% tax would equate to 9,000 a year in tax revenues. Take that $9,000 a year in tax revenues and redistribute it equally among the 10 people. Each person, universally, regardless of means or earnings would get $900 a year, or about $75 a month. The person who is unemployed gets $900 and pays no taxes because they have no earnings. The person who makes $80,000 pays $800 a year in taxes but effectively gets an extra $100 a year via the basic income. The person who makes $100,000 pays $1000 a year in taxes and thus effectively pays $100 in taxes. The person who makes $180,000 pays $1800 a year in taxes, gets the same $900 basic income as everyone else and thus really pays $900 in taxes. The benefit is that this creates a progressive tax system without the complexity. Everyone pays the same flat 1% regardless of their earnings. Everyone gets paid the same universal basic income amount annually or monthly regardless of earnings. It is a simple to administer tax system with very low overhead. In exchange, it opens the door to eliminating most and hopefully all of the social nets with complex means testing and bureaucracy. There’s no longer any need to create special tax reduction incentives or social programs for the people with low or minimal income. That reduces bureaucracy and allows us to reduce the size of the government necessary to manage it. This puts more people out into the workforce who can subsequent their basic income with full or part time work. It reduces overhead on businesses and eliminates the need to force businesses to pay a “living wage” and allows them to attract people on the basis of working to supplement their basic income. The more people brought to the island at the high end of the pay scale the more money flows into the basic income pool. As they say, a rising tide lifts all boats. In Bermuda’s case, it would make a great deal of sense to apply this to the duty system to disincentivize frivolous consumption. A flat 25% duty rate would mean someone who buys a $100 t-shirt pays $25 in duty. Someone who buys a $10 t-shirt pays $2.50 in duty. 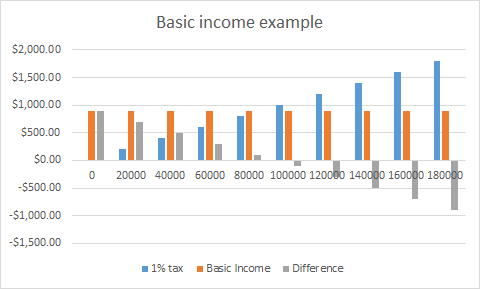 Each would get a basic income of $13.75 as a result and thus the $10 purchaser has their purchase subsidized while the $100 purchaser pays a more progressive tax. If you took 10 different shirt purchases, each $10 more than the previous and charged 25% duty on it, you’d collect $137.50 in duty from those 10 purchases. If you then divided that duty amongst the 10 people as a basic income, each person would get $13.75. The individual who purchases a shirt for $10 + $2.50 duty would have gotten $13.75 in basic income. This means that the person would effectively have $1.25 left over from their basic income to spend on something else, perhaps some food. The person who bought a shirt for $50 + $12.50 in duty would have paid $62.50, but after their $13.75 basic income is applied, the shirt would actually have cost a net value of $48.75, leaving them $1.25 to spend on something else. 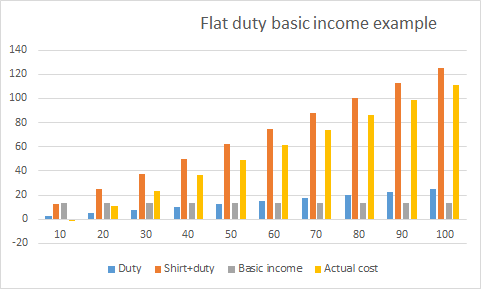 The person paying $60 + $15 duty would have paid $75 in total, which after considering their basic income would amount to the shirt having a net cost of $61.25. This means they would have paid $1.25 in actual duty expense. The person buying the $100 shirt would pay $25 in duty, which after their basic income would net them a total cost of $111.25, thus effectively paying $11.25 in duty. The purpose of this is to again create a progressive taxation system without the complexity. Rather than a crazy 460 page tariff program that is a nightmare to administer, you replace the entire thing with a flat duty rate. You take a portion of the proceeds and use it to create a basic income that helps subsidize lower cost items, mainly essentials for the poorer elements of society. The poorer elements of society are more likely to put any savings directly back into the economy which helps fuel more economic growth and create more jobs. In an ideal case we’d aim to streamline and eliminate government bureaucracy by reforming our tax systems to a flat tax structure and using the proceeds to create a universal basic income.